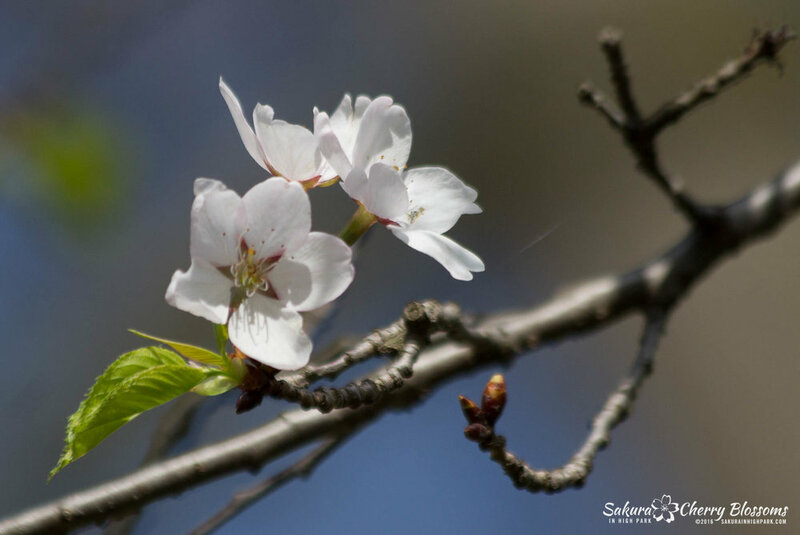 Sakura Watch, May 13, 2016 - Good, bad and lucky blossom news to report today as during a walk through the park on Friday, May 13th proved to be truly lucky in helping discover a piece of the puzzle to the mystery - why the blossoms are a no-show in High Park but many buds remain intact! In the weeks ahead you will be able to see this walk - more on that will be posted in a later update. Starting off with the good news, it does seem we will soon be seeing the Akebono / Fugenzo cherry blossoms bloom this week. A few are already open, and there are a good number of florets fully extended with clearly visible flower petals just waiting to open up. These blossoms are a different variety that tends to bloom in later May and into early June - I like to refer to them as the 'consolation prize' or even 'after party' of the sakura cherry blossoms where you still get to enjoy beautiful flowers after the main event is over. 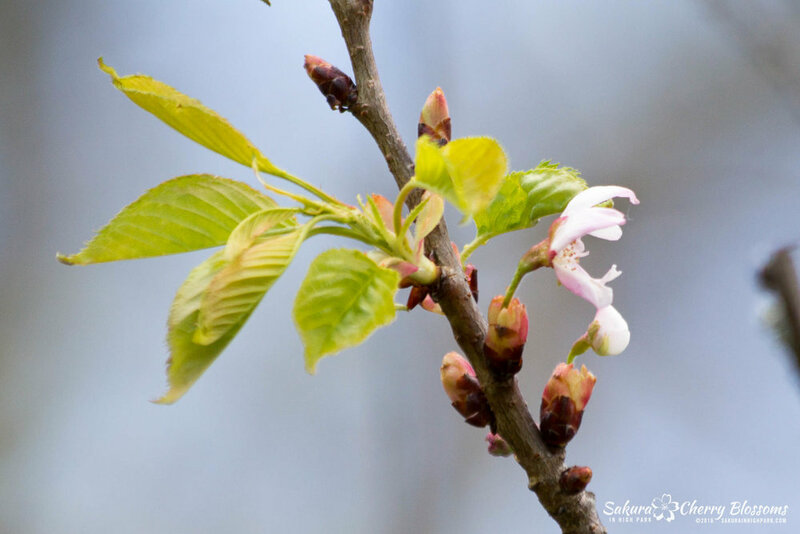 The photos into today's gallery help illustrate all the beautiful big blossoms to come! Unfortunately, it seems the park, and all its organic inhabitants, just can't catch a break from Mother Nature! After a few days of beautiful sunny weather that definitely helped the blossoms along, including my own crab apple blossoms that have magically opened and filled the tree Friday afternoon, is now going to turn back to even colder, rainy weather this coming weekend! There is also a chance of flurries for Sunday - in May! The up and down weather continues to play a big part in creating havoc in the development cycle of the sakura trees. Current observations continue to see trees with approximately 60-70% leaves and 30-40% viable buds that don't seem to be doing anything ... well, that is until now because a revelation came to light on Friday afternoon - praise the Christmas baby Jesus or other relevant religious deities you believe in! Many believe that Friday the 13th is an unlucky day. I've always had the opposite view and found 13 to be one of my favourite and lucky numbers. 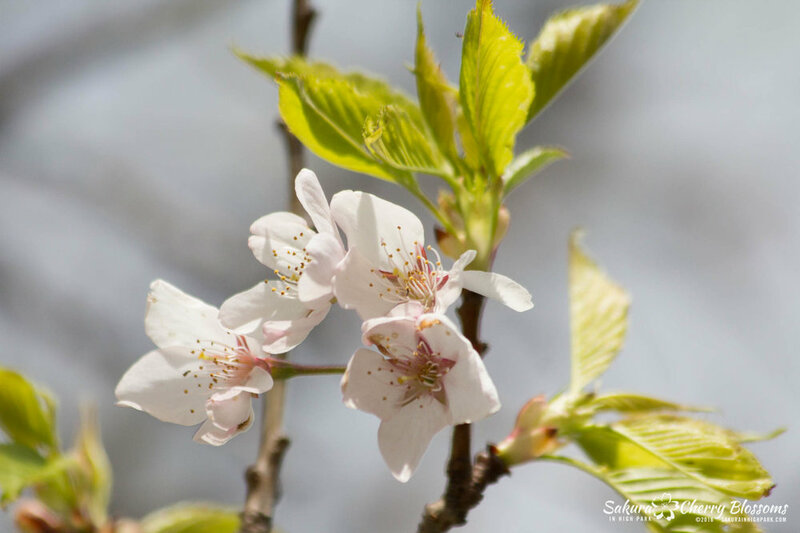 So imagine my delighted surprise that near the end of our filming along Spring Road (near the High Park Zoo and Adventure Playground) I discovered something fascinating and unexpected - sakura cherry blossoms are starting to bloom! The timing is most interesting as mid-May is getting to be the latest I've seen sakura cherry blossoms bloom, but they are in fact thriving in a way I have not seen before in that they appear to be jumping or skipping stages and going from bud straight to blossom in a matter of days instead of weeks. 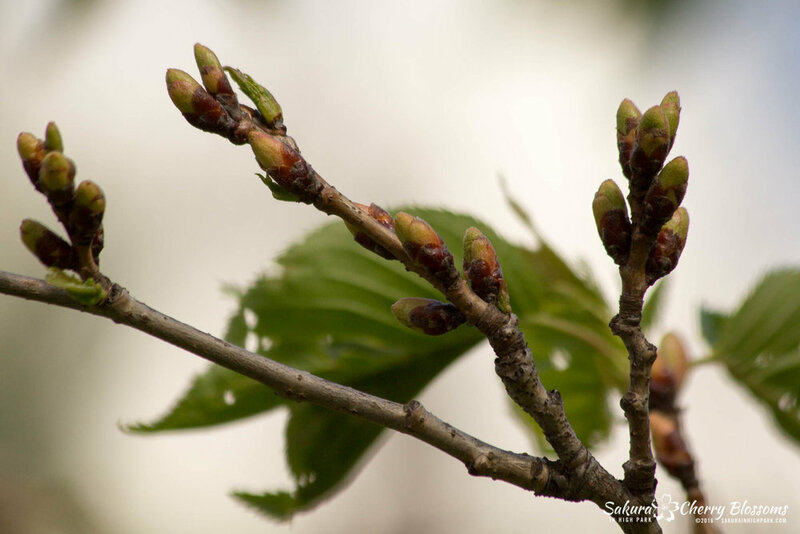 Usually, when predicting blooms, I look for the vital signs of stages of development that typically follow a set time frame of how long they will take to develop with of course weather and temperature playing its part in how faster or slower they can progress. Key stages 3 & 4 are usually a gradual change that goes over a 2-3 week period and also when the buds are most vulnerable to cold and more dependent on warmer, sunnier days to help move them along to stage 5 and eventually blossoms. 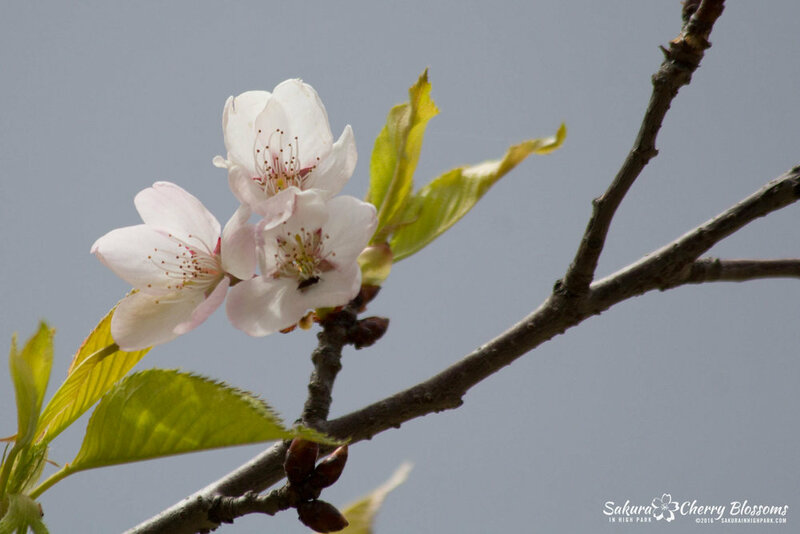 This could mean we will continue to see sakura cherry blossom clusters or small groupings opening up in the next week or two throughout the park right alongside the Akebono / Fugenzo cousins. The flowers will still be sparse and will NOT be as spectacular as a peak bloom event. However, they do give us a rare opportunity to at least experience some form of blossoms, even if only a short amount, into the final weeks of spring 2016. 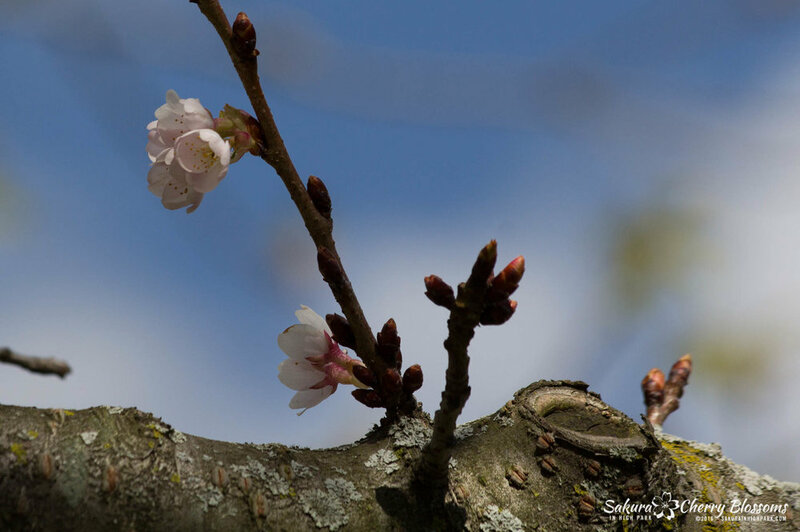 Of course, the latest news now adds an exciting twist to the Sakura Watch as I will continue to follow the progress of these new developments and with more updates - come back again early next week for more - stay tuned!